More recent discoveries, however, have prompted scholars to credit the invention of gears to the Chinese. Though there are many stories in Chinese folklore about its invention, the South Pointing Chariot is the earliest known mechanism to use gears, Emperor Huang Di was probably the original designer in the 27th century B.C.E. The chariot had geared wheels and an indicator that functioned as a compass always pointed southward. Since the chariot relied on mechanics instead of magnetism, the rider could adjust the pointer to face in any direction. Essentially, the chariot consisted of a series of gears connected to a pointing figure. The figure would continue to point in the same direction irrespective of where the chariot moved. This YouTube video demonstrates the South Pointing Chariot in motion. Scholars generally agree that the mechanism was a differential gear train like the mechanism in cars that allows the outer drive wheel to rotate faster than the inner drive wheel. During a turn difference in rotation speed would allow for traction. The device was often used for ceremonial purposes such as imperial processions and for leading soldiers into a battle. Awe-inspired spectators probably would have ascribed the “fixed pointing” to magic, rather than mechanics. The ancient Greeks were using metal gears with cylindrical teeth in early computing equipment and astronomical calendars by 100 B.C.E. Support for this conclusion comes from the discovery of the Antikythera mechanism, the oldest known gear machine. The mechanism was found in 1900 in a wreck near the Greek island of Antikythera. The device incorporated more than 30 gears for complicated astronomical calculations of time. Inside the mechanism – and a bit obscured by corrosion – are gears with triangular teeth resembling the inside of a clock, as well as a protractor-like ring divided into degrees. Nothing this sophisticated has been discovered in antiquity, nor would anything like this appear again for more than 1,000 years. Scientists were baffled by the purpose of this device for decades after its discovery. It was not until x-ray imaging of the device in the 1970s that experts determined the device replicated the motion of the heavens, and that a user could accurately track the paths of the Sun, Moon, and planets. Mainstream historians, though, disregarded the artifact initially because the x-ray images were difficult to interpret. It wasn’t until 2006 that the device drew closer attention when Mike Edmonds of Cardiff University in Wales published CT scans of the fragments that revealed more details of the inner components and inscriptions. About the size of a mantle clock, the device seems to have been encased in a wooden frame based on the wood fragments found on it. Likely the mechanism would have had a large circular face with rotating hands and a knob for winding it forward or backward. The winding moved seven hands at different speeds indicating the celestial time: one hand for the Sun, one for the Moon, and one for each of the five planets visible to the naked eye—Mercury, Venus, Mars, Jupiter and Saturn. A rotating black and silver ball showed the phase of the Moon. Two dial systems on the back functioned as a calendar and the timing of lunar and solar eclipses. Inscriptions on the device explained which stars rose and set on any given date. Alexander Jones, a historian at the Institute for the Study of the Ancient World in New York, maintains that an inscription on the mechanism reveals that the missing pointers on the face had colored balls representing the Sun and the planets. Paul Iversen, a classicist at Case Western Reserve University, found other inscriptions with the names of months. And yet another discovery indicates that a dial on the device displayed the timing of major athletic festivals, including the Olympics, Naa, a festival held in northwest Greece, and Halieia, held in Rhodes. Some experts speculate that the mechanism from the shipwreck came from Rhodes and was being shipped north. The ancient philosopher, Posidonius, had a workshop in Rhodes that could have been its source because, according to Cicero, Posidonius made a similar model of the heavens in the first century B.C. The Antikythera discovery proves that the ancient Greeks used gears to represent their scientific understanding of the universe at the time. They came to believe that nature operated with rules. Some scientists speculate the ancient mechanics weren’t just using these devices to model astronomical theories, but were also inspiring them. More than 1,500 years later, gears figured prominently in Leonardo da Vinci's sketches, especially when he accepted employment by the militant Duke of Milan, Gian Galeazzo, in 1482 to design weaponry. 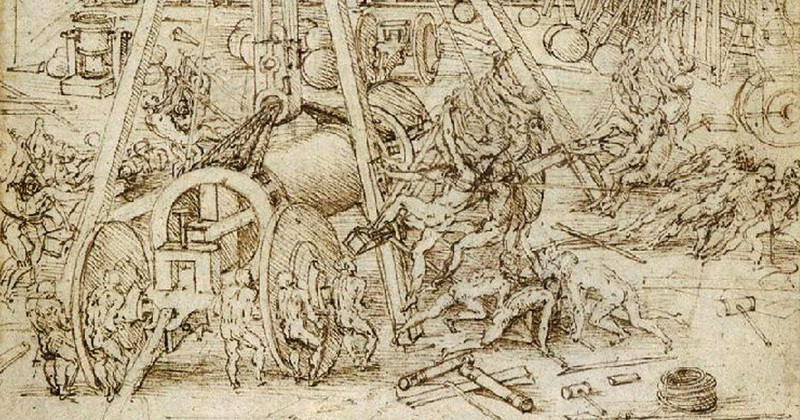 Da Vinci’s designs for the crossbow machine gun and catapults included gears to operate his massive inventions. Resembling a waterwheel, the crossbow machine gun’s wheel was an automatic loading machine. He designed two types. The first could fire four crossbows at a time, the other 16. Four men operated the gun from behind a protective shield. Interconnected gears, pulleys and ropes caused a cord to tighten prior to release and discharge of the ordinance. His catapult designs were no less spectacular. Though this weapon was in use hundreds of years earlier, Leonardo improved it with double leaf springs to produce more energy to hurl projectiles and fire balls over greater distances. Soldiers used a hand crank on the side of the catapult to load the device. 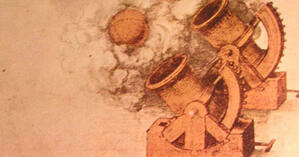 Da Vinci’s other weapons of war were a 33-barell gun, a breech-loading cannon, a steam cannon, and a multiple sling. About 300 years later, English inventor, Joseph Whitworth, filed the first patent for gear hobbing. Hobbing is a machining process to cut gears, splines (ridges on a drive shaft that mesh with groves on a companion piece to transfer torque) and sprockets (wheel with radial projections that engage a chain passing over it). His hobbing machine was a specialized milling device that made use of a cutting tool called a hob. Compared to other gear forming processes, hobbing is quick, inexpensive and accurate. It is, in fact, the most widely used method for machining spur and helical gears today. As impressive and life-changing the invention and evolution of mechanical gears is, it seems that nature beat us to the draw. Consider Issus coleoptratus, a small insect common in Europe and north Africa. This insect has an ingenious set of natural gears that allow the rear legs to “click” together for running and jumping. The insect’s “gear wheels” sit atop its rear legs. Each “spline” is between 30 and 80 micrometers thick, and there are 10 – 12 on each leg. Etymologists believe the insect uses this mechanism to plan or coordinate its jump. If the leg gears are not activated simultaneously, the insect would be off balance and fall to one side. Further research may reveal similar natural gear mechanisms in other species. Whether developed by nature or nurture, gears are a fascinating and a profoundly significant invention.